Department of Computer Science and Engineering in association with ISTE organised a 2 days workshop on Introduction to Machine Learning and AI on 30th and 31st of July 2018. Department of Computer Science and Engineering, in association with ACE (Association for Computer Engineers) & NetSec Research group, organized a three-day workshop on ‘NETWORK AND INFORMATION SECURITY’, from 9th to 11th July, 2018. A secure network infrastructure is vital to any organization’s continued progress and success. To enable this, an Accepted Computer Usage Policy (ACUP) is essential across the organization. Configuration of the network devices and systems must be compliant with these policies. Also, awareness of organization-wide information security among employees is crucial in achieving this goal. Department of Computer science and Engineering organizined an FDP on Basics of artificial intelligence and machine learning from 12 to 13 July, 2018. It was conducted as part of the nationwide “Artificial Intelligence (AI) and Deep Learning Skilling and Research”, project funded by Royal Academy of Engineering, UK under the Newton Bhabha Fund,This two-day workshop is scheduled at Mar Baselios College of Engineering and Technology for our faculty members. We have been chosen as a Zonal lead Partner in the nationwide initiative. Brunel University, London and Bennett University, India are some of the other institutional collaborators and NVIDIA and AWS Educate, Videoken and Edvantics are industry partners of this project. The project will have approximately 10 collaborator institutions, 100 Lead zonal partners and 1000 basic partner institutions and it aims to skill 10000 teachers and 1000000 Students from Engineering Colleges in India. All the details are available at the website, leadingindia.ai . technologies like blockchain, web security, vulnerability assessment and virtual reality on unity. day by the HOD of CSE Department. 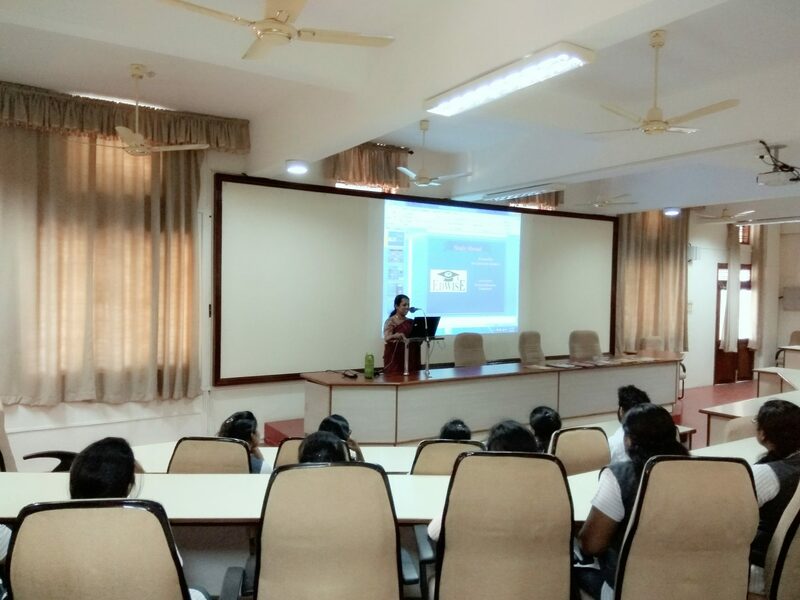 An Invited talk on “Latest Computer Technologies” by Ms.Priyabrata, Senior Software Engineer, TCS was organized on August 17, 2017. An Invited talk on “Career Opportunities” by Mr.Balachandra was organized on August 16, 2017. An expert lecture on “Seasonality Detection” by Prof. Darsana Josyula, Bowie State University, USA was organized on July 22, 2017. An Invited talk on “Advances in Computer Science and Research Areas” by Prof.(Dr) Sasikumar Punnekkat, Malardalen University was organized on July 21, 2017. An expert lecture on “Self-replication: A Computational Model – An Overview” by Prof. Jeganathan L, VIT was organized on July 21, 2017. An expert talk on “Cloud On-Chip Systems – Limitations and Opportunities” by Dr. John Jose, IIT Guwahati was organized on July 20, 2017. An Invited talk on “Multicore Architecture and Processors” by Dr. John Jose, IIT Guwahati for final year students was organized on March 30, 2017. A Motivational talk to first year students by Dr. John Jose, IIT Guwahati was organized on March 22, 2017. A talk on “Research Motivation” was arranged for the faculty of CSE by Dr. John Jose, IIT Guwahati was organized on March 22 afternoon, 2017. In Invited talk on “Technical Writing” by Prof. Narayanan E, Associate Professor, MBCET, for S7 CSE2 was organized on April 15, 2017. An Invited talk on “Software for Space: Applications, Challenges and Testing” by Mr. Tarun T.L Scientist Engineer(SE), ISRO Inertial System Unit (IISU) Trivandrum was organized by the Association of computer engineers(ACE), Department Association on 21/02/2017. A session on “Campus to Corporate” by Mahindra Naandi Foundation was arranged for S4 CSE students on 15/02/2017. A seminar on “Career Opportunities in Data Analytics” was organized by Department of CSE in collaboration with ANAKEN School of Analytics on 3/02/2017 for the final and Pre-final year students. A session on “Career Opportunities Abroad” by Edwise, Overseas Education consultant was arranged for S8 CSE & ECE students on 3/02/2017. An expert talk on ‘Fuzzy Logic and Fuzzy Sets – Properties and Applications’ by Dr.Deepak Mishra,Associate Professor,IIST was organized by the department for the final year students on 7/11/2016. The department of CSE has organized an expert talk on “Computer Vision” by Mr.Gopakumar G,Senior Research Fellow,IIST on 4/11/2016 for the final year students. A One Day Workshop on “Node JS-Server Side Programming” was organized by Department of CSE for third year students at the Infosys Development Centre on 10/11/2016. A One Day Workshop on “Interactive Web Designing” by experts from eXtremeMedia has been organized by the Association of computer engineers(ACE), Department Association on 20/8/2016. The department of CSE has organized a bridge course on “Programming in C” for S3 CSE students on 25th-29th July,2016. The course was coordinated by Mr. VishnuKumar S and Ms. Jisha John. The department of CSE has organized a Summer Training Programme on “Object Oriented Programming in C++” in association with Computer Society of India,Trivandrum Chapter for S3 students from 12th-16th July,2016.The program was coordinated by Mr.VishnuKumar S.
A seminar on “CyberForensics” was organized by the Association of computer engineers(ACE),Department Association on 20/7/2016 for the final year students. 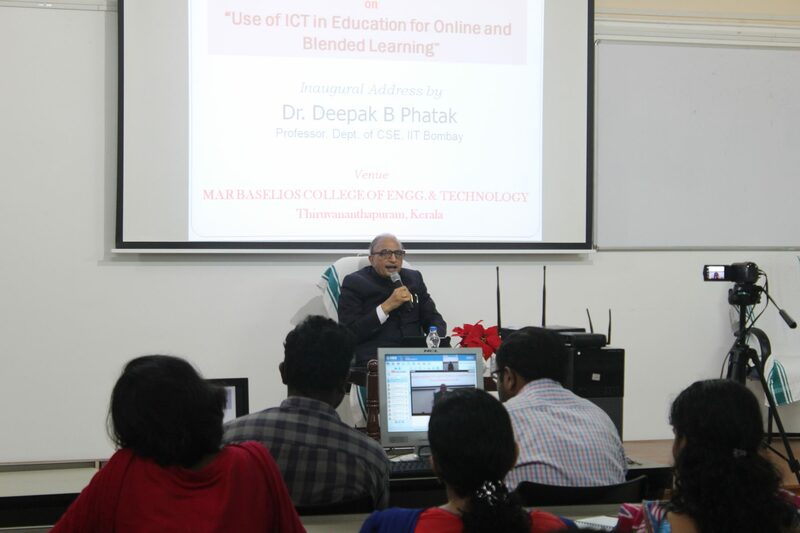 A Four Week AICTE approved Faculty Development Programme by IIT Bombay on “Use of ICT in Education for Online and Blended Learning” was organized from 14th May,2016-25th July,2016.The FDP was inaugurated by Dr.Deepak B. Phatak,Professor, Department of Computer Science and Engineering,Indian institute of Technology,Bombay.The programme was coordinated by Mr.Biju B Varghese. A one day Faculty Development Training Programme by Mr.Hari S,Infosys, for the faculties who are taking classes for Infosys Campus Connect foundation Programme was organized on July 2016.The programme was coordinated by Mr.Biju B Varghese. A Two Day Workshop on “Computer Hardware and Interfacing” was organized by Department of CSE for the teaching faculty and technical staff on 13/7/2016 and 14/7/2016.The workshop was coordinated by Ms.Anjali C.
A One Day Seminar on “SQL Tuning” was organized for B-Tech Students on 6/5/2016. The resource person Mr. Lal Cyril, Senior Technical Architect, Technology Competence and Consulting, IBS Software Services delivered the lecture.The program was co-ordinated by Ms.Tessy Mathew and Ms.Poorna B R.
A One Week Workshop on “ENFYS’16- National workshop on Recent Trends and Developments in Computer Science” was organized by Department of CSE in association with ISTE and IEEE Computer Society from 2/5/2016 and 5/5/2016.The Workshop was inaugurated by Mr.Midhun, CDAC. Special lectures were given by the following speakers Mr. Midhun,CDAC, Dr. Madhu S Nair, Department of CSE, Univeristy of Kerala, Mr. Janardhanan ,Suntech Solutions, Dr.Gorthi Sai Subramanyam,IIST and Dr. B S Manoj,IIST. The workshop was Co-ordinated by Mrs.Asha S and Mrs.DeviPriya V S. Around 25 faculties and M-Tech students from various engineering institutions and MBCET participated and benefited by this workshop. A Two Day Workshop on “Network Simulator3-NS3” was organized by Department of CSE in association with Computer Society of India, Trivandrum Chapter on 22/4/2016 and 23/4/2016. The lecture was delivered by Prof. T.S. Pradeep Kumar, VIT University. The workshop was Co-ordinated by Ms.Anitha Sandeep and Mr.VishnuKumar S. Around 30 students and faculties from various engineering institutions participated and benefited by this workshop. Ms. Aswathy Ravikumar attended a three day workshop on “Artificial intelligence and Deep Learning” on 25th to 27th June, 2018 at Saintgits College of Engineering, Kottyam. Mr. Shibu V S attended a 5 day Short Term Course (STC) on “Advanced Computer Architecture” under TEQIP at IIT Guwahatti from 10th to 14th December 2018. Dr. Jisha John and Ms. Shini Renjith attended a 6 day AICTE sponsored Faculty Development Programme on “Deep Learning” at College of Engineering, Muttathara from 10th to 15th December, 2018. Ms. Devipriya V S, Ms. Kiran Baby and Mr. Ramjith attended a 3 day workshop on “Machine Learning for Cybersecurity” at IIITMK, Technopark from 17th to 19th December, 2018. Ms. Aswathy Ravikumar, Ms, Anjali C, Ms. Poorna B R attended a 6 day Short Term Course on “Research Challenges in Data Analytics” at Sree Chithra Thirunal College of Engineering, Pappanamcode from 6th to 13th December, 2018. Ms. Aswathy Ravikumar attended a five day QIP course in “Foundations of Cryptography” on 30th July to 3rd August, 2018 at Center for continuing education Indian Institute Of Science, Bengaluru. Ms. Kiran Baby and Ms. Shini Renjith attended a one day workshop on “Photoshop” organized by MBCET Student Chapter of American Society of Civil Engineers on 20th July, 2018. Ms. Asha S, Ms. Anne Dickson, Ms.Poorna B R, Ms.Divya R S, Ms.Merin Kuriakose, and Ms.Aswathy Ravikumar attended 3 days STTP on Scientific Computing at MBCET from 18th to 20th, July 2018. Mr. Shibu V S attended a five day faculty development programme on “Industrial Robotics: Platform, Algorithms and Techniques” offered by Centre of Excellence in Robotics and IoT, in association with Department of Electronics and Communication Engineering of Federal Institute of Science and Technology (FISAT), from 16th July 2018 to 20th July 2018. Ms. Gayathri K S, Ms. Jisha Jose and Ms. Shini Renjith attended 5 days FDP on “Industry 4.0 -Towards EMBEDDED FUTURE” organised by department of ECE , in association with Catalyst (MBCET IEDC) at MBCET from 16th to 20th, JULY 2018. Mr. Robin Joseph and Mr. Binu Jose attended a one week workshop on “Machine Learning- Training the Trainers” organized by Additional Skill Acquisition Programme, Department of Higher Education, Governemnt of Kerala from 16th to 21st ,July 2018 at MBCET. Mr. Praveen G L, Ms. Anne Dickson, Ms. Poorna B R, Ms. Gayathri K S, Ms. Jisha Jose and Ms. Kiran Baby attended a two day workshop on “Artificial intelligence & Deep learning” organized by Data Analytics Group of department of CSE from 12th to 13th July, 2018. 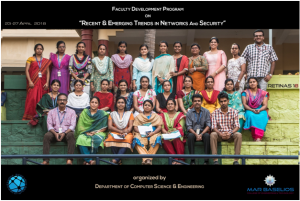 Ms. Asha S, Ms. DeviPriya V S, Ms. Anne Dickson, Ms. Divya R S, Ms. Poorna B R, Ms. Merin Kuriakose, Ms. Gayathri K S, Ms. Jisha Jose and Ms. Kiran Baby attended 3 days workshop on “Network & Information Security” organized by Department of Computer Science and Engineering, in association with IEDC and ACE (Association for Computer Engineers) from 9 to 11 July, 2018. Dr. Vishnukumar S, Ms. Jisha John attended 47th ISTE National Annual Convention held at Saintgits College of Engineering from 27th to 29th January 2018. Dr. Vishnukumar S attended 52nd Annual Convention of Computer Society of India, in conjunction with National IT Congress on the theme “Social Transformation- Digital Way” held at Science City, Kolkata from 19 to 21 January 2018. Dr. Vishnukumar S, Ms.Jisha John and Ms.Shini Renjith attended a Faculty Development Programme on Algorithms in Machine Learning at College of Engineering Trivandrum, under the FSDP scheme of Directorate of Technical Education, Government of Kerala from 18th to 22nd December 2017. Mr. Binu Jose A,Mr.Praveen G.L, Mr.Shibu V S, Mr.Robin Joesph has successfully completed FDP on ‘Algorithmics ‘Power, Limitations and Connecting the Dots’ organized by Department of Information Technology, GEC, Painavu, Idukki from 19th to 21st December 2017. Prof.Vikraman Nair attended two day workshop on Cybersecurity at CDAC during December 2017. Ms. Asha S attended a 4-Day Training Programme on Self Awareness & Integral Education, SAIE 2017 at Government Engineering College Bartonhill from November 22-25, 2017. Ms. Anne Dickson and Ms. Priya G attended a five days FDP on “Network Simulator” at College of Engineering, Trivandrum on 18-22 December 2017. 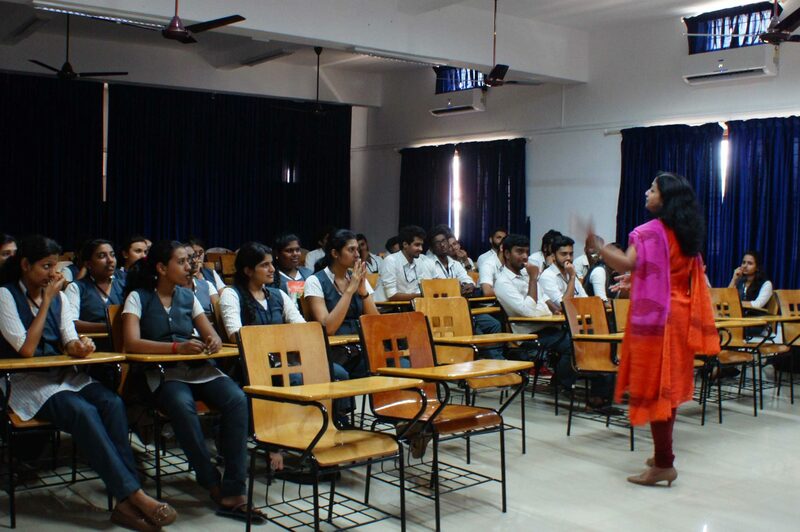 Ms. Kiran Baby has attended FDP on “Web Technologies an Industrial perspective” at Muthoot Engineering College. Dr. Vishnukumar S attended a “National Workshop on Data Science: Sales Forecast to Cognitive Computing” on 5th August 2017, at Trivandrum, organized by Computer Society of India in association with Curvelogics Pvt. Ltd.
Ms. Tessy Mathew, Mr. Praveen G L, Ms. Divya R S, Ms.Jisha John, Ms.Anjali C, Ms.Aswathy Ravikumar and Ms.Shini Renjith has participated in “National Conference on Mathematical Methods for Engineering Applications(NACMMEA-17)” organized by the Department of Science and Humanities,MBCET jointly with KMA and Co-sponsored by SERB,NBHM and KSCSTE from 27/7/2017 to 29/7/2017. Ms.Asha S, Ms.Merin Kuriakose, Ms.Gayathri K S and Ms.Jisha Jose attended a three day Faculty Development Programme on “Product Development of an IOT Device” from 26th to 28th July 2017 conducted by the Department of Civil Engineering, MBCET. Ms.Anne Dickson attended a 5 day workshop on “Technical Writing for Academicians and Researchers” at College of Engineering,Trivandrum from 24/07/2017 to 28/07/2017. Ms.Merin Kuriakose and Ms.Anjali C attended a one week Workshop on “Soft Computing for Biomedical Applications” organized by Department of ECE, MBCET during 03/07/17 to 07/07/17. Mr.Raju K Gopal, Ms.Sunitha Krishnan K S and Ms.Anne Dickson attended IEEE 5G Summit on “IoT & Cybersecurity” organized by IEEE Communications Society (ComSoc), Kerala Chapter on 1st,July 2017 at Mascot Hotel, Trivandrum. Ms.Sunitha Krishnan K S,Tessy Mathew and Ms.Anne Dickson has participated in one day workshop on “Introduction to deep learing and its application:Theory and hands” at IIST on 22nd June 2017. Mr.Shon J Das and Ms.Jisha Jose has participated in the two day workshop on “Introduction to Robotics” conducted on 9th and 10th June, 2017 held at MBCET as part of eYantra, IIT Bombay. Mr.Biju B Varghese attended a one day seminar on “Deploying iOS in Education” at Apple Technologies on 30th May, 2017. Dr. Vishnukumar S attended a National Workshop on “Market Intelligence and Digital Marketing” on 29th April 2017, at Kochi, organized by Computer Society of India. Ms. Tessy Mathew, Ms.Asha S, Ms. Anne Dickson, Ms.Gayathri K S, Ms.Shini Renjith has participated in a three day Faculty Development Programme on “Teaching Learning” organized and conducted by Teaching learning centre, IIT-Madras at MBCET from 21/4/2017 to 23/4/2017. Mr.Biju B Varghese attended a two day “eYantra Symposium” at IIT Bombay on 7th and 8th April, 2017. Mr. Robin Joseph and Mr. Binu Jose has participated and secured A+ grade in Faculty Enablement program on “Foundation program 5.0” by Infosys Limited at NMAM Institute of Technology,Nitte during 19th -23rd December, 2016. Dr. Vishnukumar S attended 51st Annual Convention of Computer Society of India, on the theme “Digital Connectivity-Social Impact” during 8th to 10th December, 2016 at Coimbatore. Ms. Tessy Mathew attended a DST Sponsored National Workshop on “Data Science Research” from 30.11.2016 to 02.12.2016 at VIT University. Mr.Shibu V S attended a IIT Bombay Initiative two-day workshop on “Introduction to Robotics” conducted on 24 & 25 November, 2016 held at FISAT sponsored by MHRD,Govt. of India, under NMEICT. Ms. Anitha Sandeep, Ms. Sunitha Krishnan K S and Ms. Anne Dickson attended a one week Faculty Development Training Programme on “Maths4CS” conducted by Govt. Engineering College, Bartonhill from 04/01/2017-07/01/2017. Mr. Robin Joseph and Mr. Binu Jose attended a one week Faculty Development Training Programme on “Foundation Program 5.0″ conducted by Infosys Limited at NMAM Institute of Technology, Nitte from 19/12/2016-23/12/2016. Ms.Anjali C and Mr. Robin Joseph attended a one week Faculty Development Training Programme on “Free and Open Source Software” organized by Department of CSE, SCT College of Engineering in association with SPACE from 13/12/2016-17/12/2016. Ms. Tessy Mathew attended a three day DST sponsored national workshop on “Data Science Research at VIT University from 30/11/2016 to 2/12/2016. Mr. Shibu V S attended a one week Faculty Development Training Programme on ” E-Yantra-A Robotics workshop at IIT Madras on December 2016. Mr. Binu Jose attended a two day workshop on “Human Values Development Programme(HVDP) ” organized by Mar Ivanios College, Trivandrum from 31/10/2016 to 1/10/2016. Ms. Anne Dickson attended a two day workshop on “Network Security” organized by Department of Information Technology, govt. engineering college, Bartonhill from 7/10/2016 to 8/10/2016. Mr. Biju B Varghese and Mr. Binu Jose attended a one week Deep Dive Faculty enablement Programme on ” Bigdata and Analytics” at Infosys Limited, Mangalore Development Centre from 22/08/2016 to 26/08/2016. Ms.Asha S,Ms.DeviPriya V S,Ms.Divya R S,Ms. Poorna B R,Mr.Robin Joseph and Mr.Binu Jose attended a Four Week AICTE approved Faculty Development Programme by IIT Bombay on “Use of ICT in Education for Online and Blended Learning” from 14th May,2016-25th July,2016. Aswathy Ravikumar participated in the one day workshop on “Spoken Tutorial Expertise An Insight”, organized by FOSS Centre , Centre for Continuing Education and Department of Computer Science & Engineering, Amal Jyothi College of Engineering in association with ISTE Kerala Section on 16 July 2016. Jisha Jose, Shibu V.S has participated in the Faculty Development Programme on ‘Principles and Practices of Parallel Computer Architecture organized by the Department of CSE , Mohandas College of Engineering and Technology from 7 to 9 July, 2016. Shon J Das has attended a Faculty Development Training Programme on “Python Programming and Database Concepts” from 20th– 25 th June 2016, conducted by Infosys Limited. Sandeep S.R participated in the MHRD-TEQIP Sponsored Faculty Development Programme on “Remote Sensing and GIS Techniques” organized by the Department of Architecture, National Institute of Technology, Calicut from 27th June- 1st July,2016. Praveen G.L, Gayathri K.S attended a six day workshop on ” Advanced Graph Theory” organized by Department of Computer Science & Engineering, LBSITW, Poojappura from 6th – 11th June 2016 under the sponsorship of TEQIP-II. Ms. Asha S, Ms.DeviPriya V S,Ms.Divya R S,Ms.Poorna B R, Ms.Jisha John,Ms.Anjali C,Ms. Merin Kuriakose,Ms.Gayathri K S and Ms.Aswathy Ravikumar attended a One Week Workshop on “ENFYS’16- National workshop on Recent Trends and Developments in Computer Science” organized by Department of CSE in association with ISTE and IEEE Computer Society from 2/5/2016 and 5/5/2016. Mr. Biju B Varghese attended a Faculty Development Program on “Self-Knowledge in Education” from 25th April 2016 to 27th April 2016 organized by Sahrdaya College of Engineering & Technology. Ms.Anitha Sandeep Mr.Shibu V S, Mr.VishnuKumar S, Ms. Anjali C and Ms. Gayathri K S attended a Two Day Workshop on “Network Simulator3-NS3” organized by Department of CSE in association with Computer Society of India, Trivandrum Chapter on 22/4/2016 and 23/4/2016. DeviPriya V S has successfully Completed NPTEL Online 12 week Certification course on “Switching Theory” on September, 2018. Robin Joseph has successfully completed NPTEL Online 8 week Certification Course on “Introduction to R Software” on September, 2018 with Elite Certification. Robin Joseph has successfully completed NPTEL Online 12 week Certification Course on “Joy of Computing Using Python” on September, 2018 with Gold Certification. Binu Jose has successfully completed NPTEL Online 8 weeks Certification Course on “Database Management Systems” on September, 2018. Naicy M John has successfully completed NPTEL Online 8 week Certification Course on “Cloud computing” on September, 2018. Jisha John has successfully completed NPTEL Online 8 week Certification Course on “Introduction to Machine Learning” on October, 2018 with Elite Certification. Anjali C has successfully completed NPTEL Online 8 week Certification Course on “Introduction to Machine Learning” on October, 2018 with Elite Certification. Ms. DeviPriya V S has successfully Completed NPTEL Online 12 week Certification course on “Introduction to Internet of Things” on May, 2018. Mr. Binu Jose A has successfully completed NPTEL Online Certification course on ‘Fundamentals of Database Systems’ with a consolidated score of 79% organized by IIT Kanpur in association with NASSCOM. Mr.Robin Joseph has successfully completed NPTEL Online Certification course onon Programming Datastructures and algorithm using Python with consolidated score of 99%. Ms. Gayathri K S has successfully Completed 12 weeks online course on Introduction to Internet of Things conducted by NPTEL with a score of 92%. Mr. Praveen G L received an Elite Certificate for the NPTEL online course on “DESIGN AND ANALYSIS OF ALGORITHMS” conducted by IIT Madras during January-March 2017. Mr.Shibu V S got an Elite NPTEL certificate for successfully completing a 12 week online course on “COMPUTER ARCHITECTURE” during Jan-April 2017. Ms.Jisha John completed a 4 week NPTEL course on “MEDICAL IMAGE ANALYSIS” by Indian Institute of Technology Kharagpur during Feb- March, 2017. Ms.Shini Renjith completed a course on “MACHINE LEARNING FOUNDATIONS: A CASE STUDY APPROACH” via Coursera by University of Washington. Ms.Devipriya V S completed a 8 week NPTEL online course on “PROGAMMING IN C++” by Indian Institute of Technology Kharagpur during Feb- March, 2017. Ms.Naicy M John completed a 8 week NPTEL online course on “DESIGN AND ANALYSIS OF ALGORITHMS”. Ms.Anjali C has completed 8 week course on “Machine Learning Foundations: A Case Study Approach” by University of Washington. 5 week course on “Introduction to Programming with Java – Part 1: Starting to Code with Java” by University Carlos III of Madrid. Microsoft certified 5 week course on “Introduction to cloud computing”. Ms.Naicy M John has completed 8 week course in NPTEL on “Introduction to Operating System”, by IIT Madras. Tessy Mathew, U. Srinivasa Rao and L. Jeganathan ; “Error Bounds for Darboux Integral of Continuous Functions with Supremum Norm Using Cellular Automaton”; International Journal of Control Theory and Application ( ISSN : 0974-5572), Vol. 9, 2017. Ms. Shini Renjith; “B2C E-Commerce Customer Churn Management: Churn Detection using Support Vector Machine and Personalized Retention using Hybrid Recommendations”; International Journal on Future Revolution in Computer Science & Communication Engineering (ISSN: 2454-4248), Vol. 3, Issue: 11, November 2017. Vishnukumar S and M. Wilscy. “Single image super-resolution based on compressive sensing and improved TV minimization sparse recovery.” Optics Communications, Elsevier June 2017 (SCI Impact Factor: 1.588). Vikraman Nair published a paper titled “Ontology for Launch Vehicle Mission Simulation”, JOURNAL OF AEROSPACE INFORMATION SYSTEMS, Vol. 14, No. 3, March 2017. Dhananjay J, Jayajith J.J, Meenu Chandran, Jisha Jose published a paper titled “OpenBot” in International Journal of Science, Engineering and Technology Research, Volume 6,Issue 6,June 2017,pp.012-1015.ISSN: 2278 – 7798. Raju K Gopal published a paper titled “A Novel Data Storage Solution for Cloud”, International Journal of Engineering Research & Technology, January 2017. To be a Centre of Excellence in Computer Science and Engineering providing quality education and research for the betterment of the society. To impart sound knowledge in theoretical and applied foundations of Computer Science and Engineering, and to train the students to solve real life issues to effectively define and shape life.